Studied Law at the Universidad Católica Argentina, receiving his degree in 1984. He began his career in the field of administrative law, the study and deeper knowledge of which served to complement his strong civil law background. 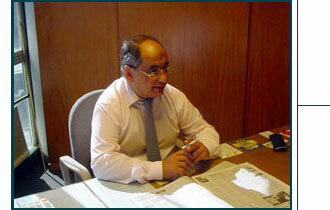 He began working in 1985 in the law firm of Attorney Daniel Palenque Bullrich. During that period he learned and practiced tax law, particularly in the field of Customs and from both a substantive and procedural standpoint, before the Federal Tax Tribunal. In 1987, he joined the law firm Julio César Crivelli - Asesores Jurídicos, continuing to form part of this firm's legal team up to the present, as Senior Associate Attorney. His academic activities have included a post as Associate Professor of Civil Law III (Contracts), chaired by Attorney Alberto G. Spota, and, in 1984, as Assistant for the course on Social Ethics given at the Universidad Católica Argentina. In 1984, he served as Assistant Professor for BASIC LIBERAL ARTS studies at the University of Buenos Aires, where he was in charge of a course called "Institutions of Private Law". He also served as Assistant Professor of Civil Law III (Contracts) at the Universidad del Salvador (Buenos Aires), a course chaired by Attorney Juan Carlos Pierre, and was a regular contributor to the legal publication "EL DERECHO" from 1985 to 1998, writing on Property Law.